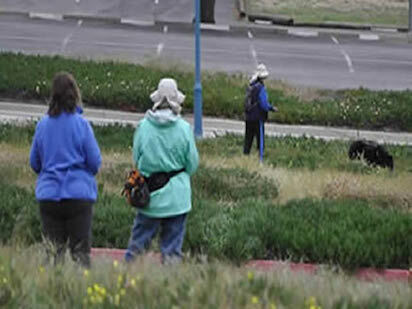 From 1966 to the present, Monterey Bay Dog Training Club, Inc, has provided knowledgeable, on-going professional obedience training to the dog owners of Santa Cruz, San Benito, and Monterey Counties. Our training facilities are located at the Santa Cruz County Fairgrounds in Watsonville and at the MidCountySeniorCenter on Bay Ave in Capitola. We take pride in being the very first Dog Training Club as well as the first AKC Member obedience club recognized in the area. We provide training at all levels…puppy, beginning 1 & 2, novice, open, and utility. Our program also offers all levels of Rally classes. The quality of our training is demonstrated by the number of handlers who return with their new dogs and the referrals we receive from former students. Come, Sit, Stay with Monterey Bay ! Click “RUFF NOTES” to download the latest issue of the club's newsletter. We support the Dog Fancy by hosting Obedience Workshops, sponsoring Obedience and Agility Trials, offering a Variable Surface Tracking Test, and providing Canine Good Citizen certification. We are a civic minded group pledging ourselves to support a variety of dog related activities with scholarships (UCDavis) or donations: Morris Animal Foundations, Canine Companions for Independence, Guide Dogs for the Blind, Disaster donations, and one close to our heart, "Gifts From The Heart" for pets in need of veterinary care. We provide dog demonstrations whenever asked and always look forward to joining the 4th of July parade in Aptos and enjoying our yearly participation at the Santa Cruz County Fair (pictured above). Our Instructors come from a long history of actively being involved with dog training. Starting out by training and showing their own dogs for years, they moved into the next step … using those many years of experience to share their knowledge with the dog owners attending our classes. Our class fees for 8 week classes are the most reasonable around.